Opening with Lunch Snacks on Thu, March 14 at 12.00pm, opens till 6pm. Get your Ticket for the Exhibition and the 10 Years Anniversary Conference here! Hall passes start at 15 SGD and also provide access to the opening and closing. Book Your Booth at the Exhibition! Early-Bird options until Jan. 20. Booth and Sponsorship options are available for you here. Meet companies, startups and Free and Open Source software projects. At the exhibition you find developers and executives of top tech companies like Google, Daimler/Mercedes, and Microsoft. 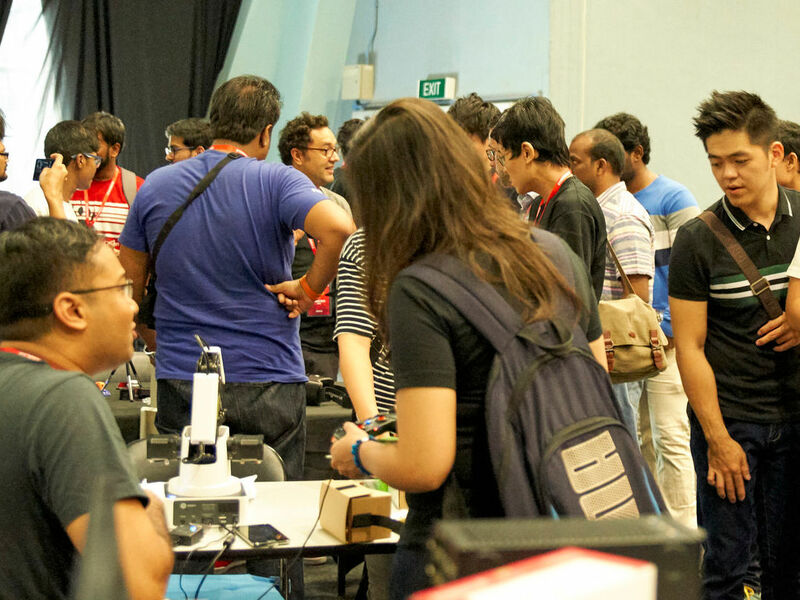 Visit the Open Hardware showcases, join hands-on workshops and test conversational chatbots. Learn about the Pocket Science Lab, and how to develop your own project with Arduinos. Learn about jobs, discuss career strategies or get insights about the latest tech ideas from core developers of projects like VLC, Debian, CentOS, FreeBSD and many more at the exhibition. Find like-minded technologists in the exhibition lounge and get inspired in lightning sessions by exhibitors. 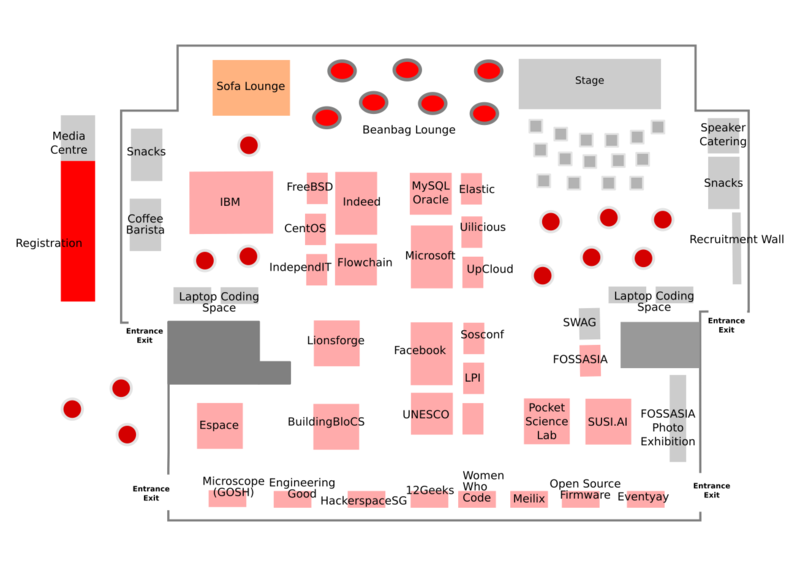 The FOSSASIA Summit exhibition is the opportunity to meet FOSS companies and projects from around the world. 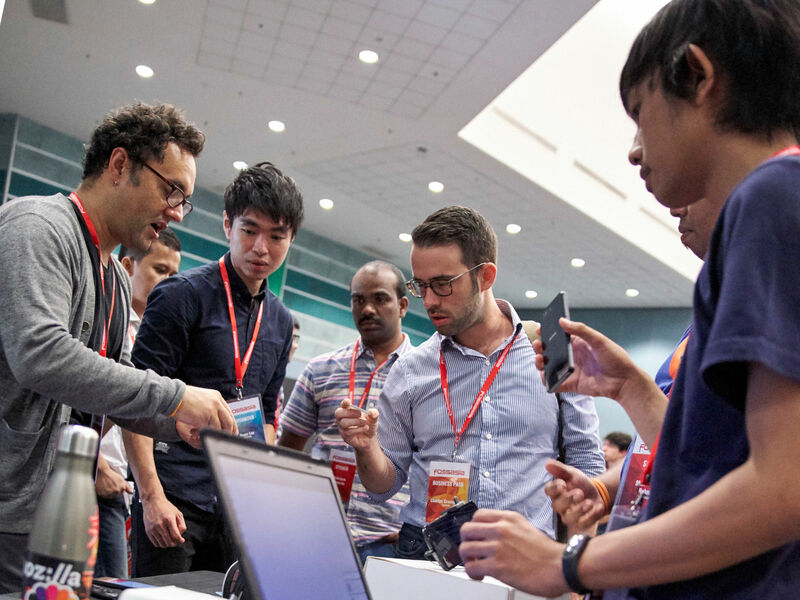 Learn about the latest Open Source technologies, meet representatives to discuss job opportunities, get your gadget in a hands-on lab and socialize in the exhibition lounge area. Hall passes start at 15 SGD. 12Geeks is a platform where makers and developers can connect, discover and share projects, get access to tools and knowledge. BuildingBloCS students will showcase their maker projects in MicroPython as part of the school's IMDA Digital Makers Programme. Come, solder and make your FOSSASIA led keychain. Be a Jedi or Sith with our lightsabers. At our booths you will test whether you are the worthy one to lift the Mjölnir. An Open Source hardware device (open on all layers) that can be used for experiments by teachers, students and citizen scientists. This tiny pocket lab provides an array of sensors for doing science and engineering experiments. It comes with functions of numerous measurement devices including an oscilloscope, a waveform generator, a frequency counter, a programmable voltage, current source and as a data logger. HackerspaceSG is Singapore's very own Hackerspace. Built by and for geeks, nerds, inventors, engineers, and entrepreneurs, HackerspaceSG is the Singapore hacker community's home, living room and laboratory. We host regular events, meetups, presentations, workshops, and movie nights for the local community. Launched in 2013, the Lifelong Learning Institute (LLI) is one of two Continuing Education and Training campuses (CET) by SkillsFuture Singapore (SSG). As a vibrant adult-learning campus, LLI serves as a gateway for in-demand skills training and professional upgrading programmes. LionsForge Pte Ltd wants to empower the masses to make things with the help of easy-to-use technology and by so doing, spark the next industrial revolution right from the home. We aspire to provide the resources to better the lives of the common people through technology, training and education. Our philosophy of “Make in Singapore” is to empower every Singaporean to believe that they can build their own successful products through innovation and resourcefulness. Join FOSSASIA Media Team! Learn, explore and have fun! The Microsoft cloud supports a wide range of industry leading operating systems, languages, tools, and frameworks. It puts the best of Windows and Linux ecosystems at your fingertips, so you can build great applications and services that work with many devices. Come visit the Microsoft booth for fun quizzes on cognitive services and bots, as well as cool giveaways! The Open Source Initiative (OSI) is celebrating its 20th Anniversary in 2018. As a global non-profit, the OSI protects and promotes open source software, development and communities, championing software freedom in society through education, collaboration, and infrastructure. Recruitment wall is located in the lobby near the registration. Our partners will advertise there latest job openings. Check them out! Susi AI is a server application which is able to interact with humans as a personal assistant. Susi AI is using a wide variety of sources and data to provide answers or perform actions demanded by the user. Susper is a decentralized Search Engine that uses the peer to peer system yacy and Apache Solr to crawl and index search results. There will be various hands-on workshop taking at this tinkerlab during the FOSSASIA Summit. Do stop by! UI-licious is a solution for automating user interface testing for websites that is easy to use and easy to maintain. It is perfect for lean engineering teams that want to increase their test coverage through automation but have a evolving product and rapidly change UI. Teams can save up to 70% of their time writing and keeping tests up to date using UI-licious’s intuitive testing language. 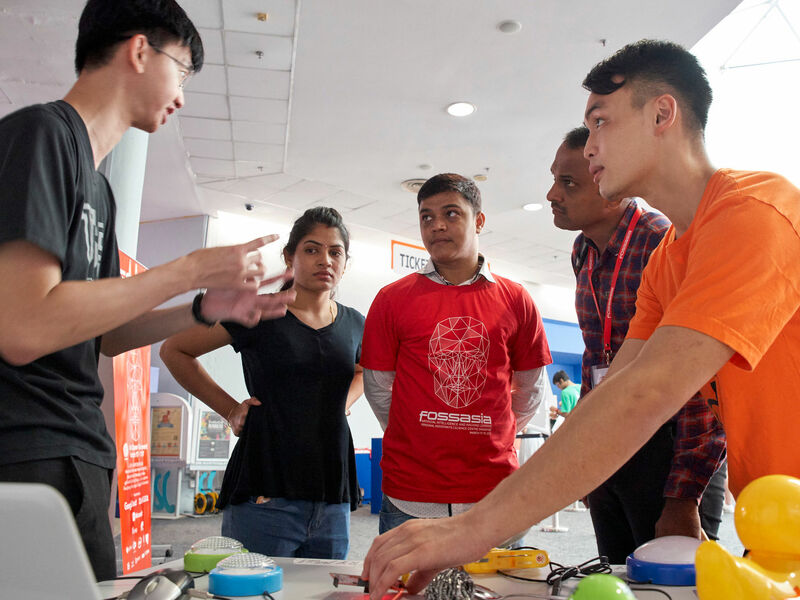 Join UNESCO Science and Open Data Hackathon at FOSSASIA Summit. Women Who Code connects amazing women engineers around the globe who unite under one simple notion – the world of technology is better with women in it. Locally, WWCode Singapore produce in-person events aimed at inspiring women engineers to excel in technology careers. FOSSASIA SWAG + Membership Get your shirt and become a member! Get your FOSSASIA Coffee and Swag and stay connected as a supporting member.